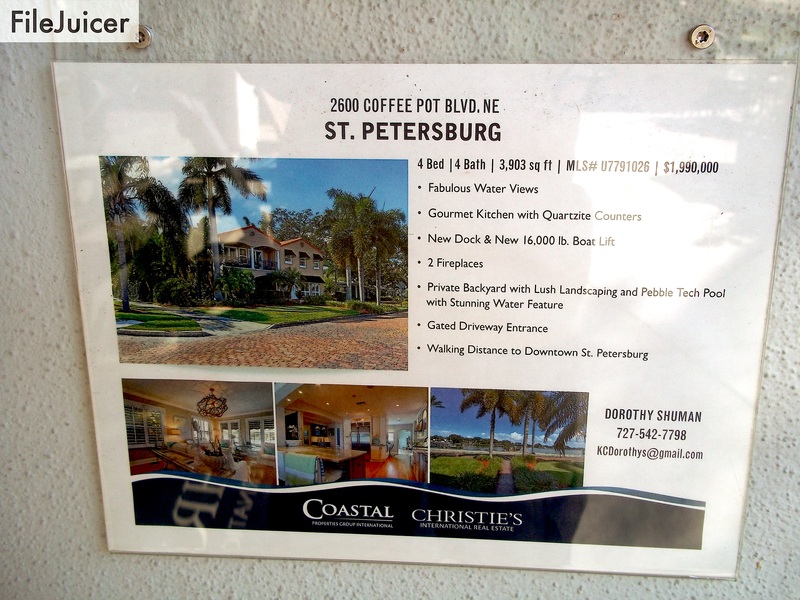 A visit to St. Petersburg was on our calendar last weekend. We were guests at a holiday party that my boss hosted for all of her far-flung staff around the state of Florida. Get a bunch of librarians together, ply them with cocktails, and then watch spouses wince as painfully bad jokes are told for the hundredth time (example: “How many librarians does it take to change a lightbulb? Usually 645.5. Sometimes 808.882”)¹. It was great to meet new and interesting co-workers, and also fun having the opportunity to visit a place neither my wife nor I have ever been before. 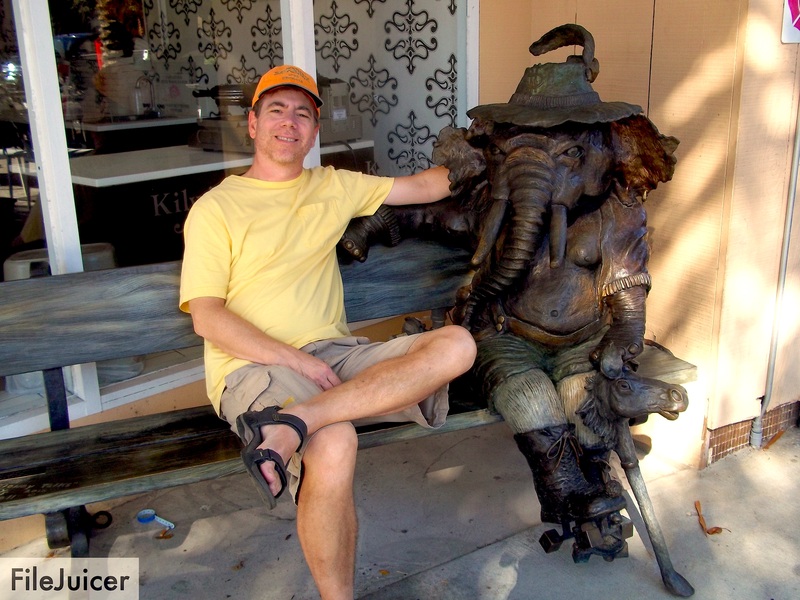 We stayed at the Hollander Hotel, a boutique property located in St. Petersburg’s downtown area. Seemingly everyone who worked there went out of their way give us suggestions on what to see, where to walk, etc. Since we were only visiting for 24 hours, we decided that all we wanted to do was just walk around and see as much as possible. As my dad used to admonish on rare vacations, “no lingering!” As a result, we did unfortunately miss the popular Salvador Dali and Dale Chihuly collections at two different museums. We’ll have to return for each of them someday. But on one beautiful afternoon, and an equally beautiful morning the following day, we walked the streets and saw as much of the area as possible. We immediately observed two things: (1) St. Petersburg has some very quirky bars, and (2) it’s apparently a great place to be if you’re a dog. Or a dog owner. We saw lots of both. I always thought that Portland, Oregon had a lock on the number on the number of fun-sounding bars, but St. Petersburg gives it a run for its money. Everywhere we turned we kept laughing at the different names. I snapped a few of them for you. It’s always best to ask a dog owner if you can take a picture of his or her pet ahead of time. That’s not always possible, of course, when either dog or master is on a mission and moving fast. Still, we met quite a few fine pooches whose owners were more than happy to make our acquaintance. I am sadly not a photographer. My six-year-old Kodak M530 is a point-and-shoot specifically designed for camera-challenged people like myself. It fortunately takes better pictures than my five year old iPhone, but neither really produce anything stellar looking. This is all another way of saying how desperately cheap I am. To add insult to injury, my many thumbs deleted all of the pictures on the Kodak’s SD card during the process of transferring them to my laptop. I have no idea how this happened. Luckily I found a way to recover them courtesy of a shareware app called “File Juicer.” I even happily paid the shareware fee to remove the “File Juicer” label on each of the recovered pictures. But even that I somehow managed to screw up, so please ignore that unfortunate wording on each of the pictures below. File Juicer, you owe me something for free advertising here! For a real photographic blogger who definitely knows what she’s doing, check out QP and Eye. Linda Stewart is a gifted photographer who takes her readers on many an interesting journey from her home in Australia. She’s also a pretty great writer too. I definitely recommend her. The Hollander Hotel doesn’t really have a consistent theme. 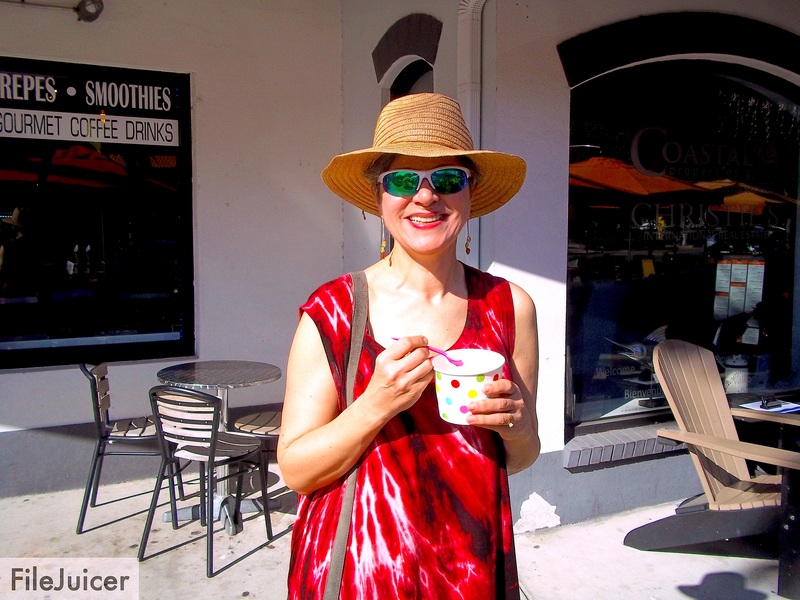 It’s part Hollywood, part Florida history, and, well, mostly eclectic. It was a fun place to stay and the staff was incredibly helpful and friendly compared to most chain hotels. There may not be snow, but St. Petersburg still found a way to be festive. 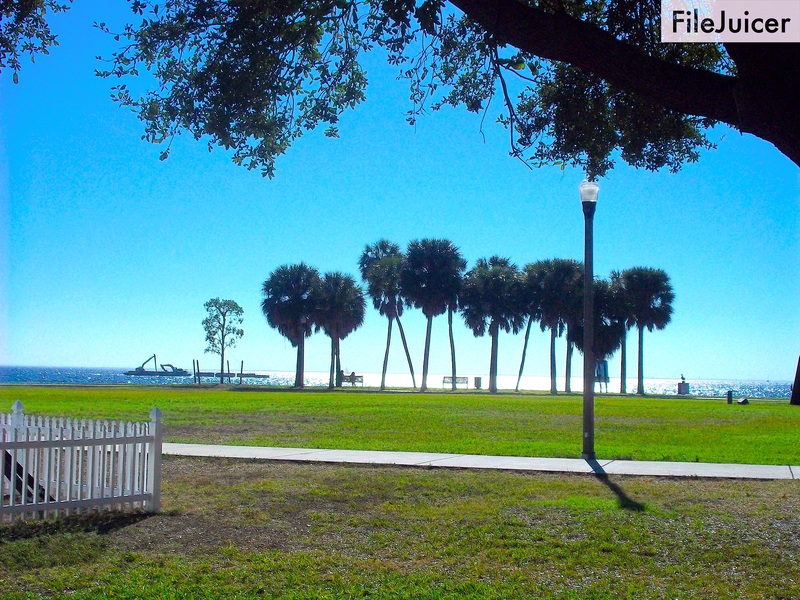 At the Tampa Bay waterfront, we walked around Vinoy Park. 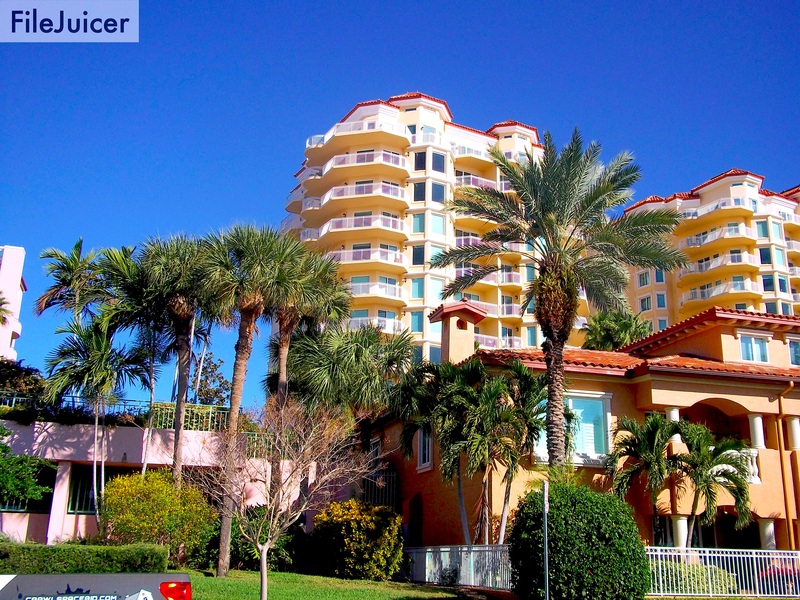 It’s named after the adjacent Vinoy Park Hotel, which was built in 1925. Care to buy a condo with a view? How about something larger? Say, 4000 square feet? $2,000,000 is just a Mega Millions jackpot away. 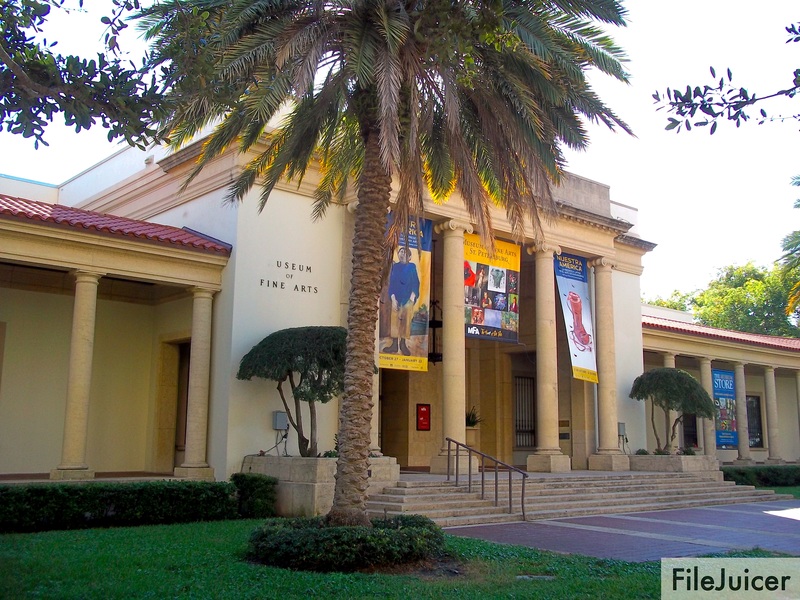 The Useum of Fine Arts. You gotta save money where you can apparently. Start with the lettering before you get to the staff. Ahem. SOMEONE had frozen yogurt at 10:30 in the morning. That breaks all the rules. I made sure not to discuss politics with this guy. ¹ For the uninitiated, these are Dewey Decimal classification numbers. Library humor is not for the hipsters amongst us. Great photos! I love the Dewey Decimal joke. There are no time restrictions on frozen yogurt! It’s like coffee. You can have it at any time of the day or night. I got the Dewey joke right away and as soon as you win the lottery I’d like to visit your new home. Oh, you’re probably right. At the time I showed dramatic, puritanical umbrage at the yogurt ingestion. She ignored me. I’m glad that File Juicer saved the day! Your pictures are fun. I, too got the joke… even though I’m definitely a hipster (she said ironically). The only thing that deserved umbrage was the useum. Yogurt and 10:30 am go together perfectly. Perhaps the joke is mostly on me: I felt compelled to explain it! It looks like a great place — I’ve always wanted to see the place! Yes, apparently I am outvoted on that matter. 🙂 Thanks for reading! I do. And a phone! Looks like you took your father’s advice and covered lots of ground in your short time there. Thanks for sharing. LOVE the bar names! Well, lame, really. But nice of you to say that. 😉 Thanks!